I bought this on a whim last week and have now almost finished reading it. It’s based on the BBC Radio 4 radio series of the same name, which dealt with the various acts and processes that have either bound together or forced apart the different constituent parts of what I for brevity’s sake shall call the British Isles. The presenter/author, Linda Colley (professor of history at Princeton), also discusses the role national myths and symbols (the sea, the monarchy, the empire) have played in this, and she underlines their flexibilty and contingency. That last point may seem obvious to most people who’ve looked at the history of Ireland, but is perhaps less present in the minds of some of the English, judging by certain Conservative politicians and their recent comments on the First World War. In many ways, this new state, which evolved into the Republic of Ireland, was an impressive achievement, a democracy that has endured. But its 1937 constitution proved another compromised act of union. It laid claim to ‘the whole island of Ireland’. It also declared that Gaelic was Ireland’s national language and that Catholicism was its national religion. I wonder how de Valera would have reacted to hearing his ‘baby’ compared to the hated 1800 act of parliament that made the whole of Ireland and Great Britain a unitary state, and which Irish nationalists spent most of the nineteenth century trying to reverse? He is often described as the king who lost America. He can with more justice be viewed as the monarch who helped to sabotage a moderately enlightened settlement with Ireland. She moves from this onto other links between Britain and Ireland, finishing up by discussing the Home Rule movements and Irish independence. 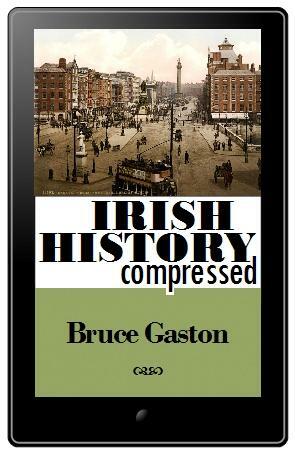 You can find out more about the Act of Union, the Home Rule movement, and de Valera’s 1937 constitution in the Irish History Compressed e-book.